Caabu would like to invite Members for a briefing with doctor and activist Mads Gilbert, who will talk of his experiences as a doctor during Israel's 2014 war on Gaza. This event is for Caabu members only. If you're not already a member and would like to sign up as a Caabu member to attend this event, you can do so here. Mads Gilbert will be speaking about his new book, 'Night in Gaza'. The book details Dr Gilbert's experiences working in al-Shifa hospital during the 'Operation Protective Edge' attacks on Gaza, last summer. Please email Joseph Willits (willitsj@caabu.org) to confirm your attendance. When: Tuesday 16 June, 2pm Where: Thatcher Room, Portcullis House, Houses of Parliament. 'Night in Gaza': In the summer of 2014, Gaza was attacked by Israel for the fourth time since 2006. This attack lasted fifty-one days. Mads Gilbert, a Norwegian doctor, had worked at al-Shifa Hospital during each previous conflict, and in July 2014 he went back there. 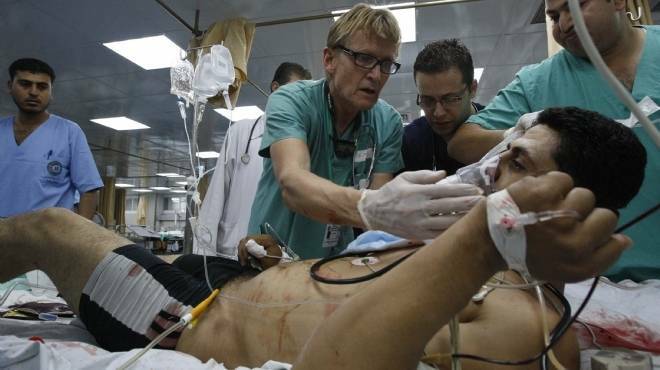 While he was helping the wounded, he kept a camera in the pocket of his green operating scrubs. In this book, he tells the story in words and images of the fifteen days of bombing and human suffering that he witnessed. At the same time, this book is a tribute to the courage, endurance and almost inconceivably strong spirit of Palestinian health workers and volunteers, a spirit replicated throughout the severely tested society of Gaza, occupied Palestine. Dr Mads Gilbert is a Norwegian doctor and specialist in anaesthesiology. He is a specialist in anesthesiology and head of the emergency medicine department at the University Hospital of North Norway, and co-founded the Norwegian Aid Committee (NORWAC). He is the co-author, with his colleague Erik Fosse, of 'Eyes in Gaza', an account of their experiences in Gaza City's al-Shifa Hospital during Israel's deadly assault on Gaza during 'Operation Cast Lead' (December 2008 - January 2009). He was working at al-Shifa again during Israel's last assault on Gaza last summer, which killed more than 2,100 Palestinians and injured over 11,000. Since 1967, Caabu has taken on a strong political, educational and media role. A cross-party organisation, with Chairs from all the main political parties, Caabu works to advance Arab-British relations through its support for international law, human rights and democracy. Israel has banned Norwegian doctor and human rights activist Mads Gilbert from entering Gaza for life. Gilbert, a professor at the University Hospital of North Norway, where he has worked since 1976, earned international renown for his philanthropic work in late 2008, during Israel’s Operation Cast Lead, an attack that, according to Israeli human rights organization B’Tselem, killed roughly 1,400 Gazans, including almost 800 civilians, 350 of whom were children. The aid worker, along with fellow Norwegian doctor Erik Fosse, decided to volunteer in Gaza as soon as he heard that bombing had started, on December 27, 2008. Thanks to diplomatic and economic support (in the sum of $1 million dollar of emergency funding from the Norwegian Ministry of Foreign Affairs), the two physicians managed to arrive in the strip by December 30. The Israeli government prevented all international press from entering Gaza during Cast Lead (a documentary, The War Around Us, was made about the only two foreign reporters in the strip at the time), in what Gilbert called Israel’s insidious “PR plan.” The doctor, as one of the only international aid workers in Gaza, thus devoted considerable time to speaking with local Palestinian news outlets, some of whom were reporting on behalf of foreign networks including BBC, CNN, ABC, and Al Jazeera. BBC aired an interview with Gilbert, conducted in the hospital. The questions asked, and the answers garnered, were eerily similar to those he would give just five years later, during Operation Protective Edge. The interviewer began asking him to respond to Israel’s claims that it was not targeting civilians, that it was only attacking Hamas militants. Gilbert called the claim “an absolutely stupid statement” and explained that, among the hundreds of patients he had seen at that point, only two had been fighters. The “large majority” were women, children, and men civilians. “These numbers are contradictory to everything Israel says,” he reported. In 2008 and 2009, Gilbert treated Palestinians who had been grievously wounded by Israel’s use of experimental and illegal chemical weapons, including white phosphorous, dense inert metal explosives (DIME) munitions, and flechette shells. In July 2014, in the midst of Israel’s most recent attack on Gaza, Gilbert spoke with Electronic Intifada, revealing that he saw indications of renewed use of DIME weapons and flechettes. While volunteering in Shifa hospital this past summer, Gaza’s principal medical facility, Gilbert penned an open letter, lamenting the unspeakable horrors the Israeli military was instigating. [Israel’s] “ground invasion” of Gaza resulted in scores and carloads with maimed, torn apart, bleeding, shivering, dying… All sorts of injured Palestinians, all ages, all civilians, all innocent. The heroes in the ambulances and in all of Gaza’s hospitals are working 12 to 24‑hour shifts, grey from fatigue and inhuman workloads (without payment in Shifa for the last four months). They care, triage, try to understand the incomprehensible chaos of bodies, sizes, limbs, walking, not walking, breathing, not breathing, bleeding, not bleeding humans. Humans! … Ashy grey faces – Oh no! not one more load of tens of maimed and bleeding. We still have lakes of blood on the floor in the emergency room, piles of dripping, blood-soaked bandages to clear out – oh – the cleaners, everywhere, swiftly shovelling the blood and discarded tissues, hair, clothes, cannulas – the leftovers from death – all taken away… to be prepared again, to be repeated all over. Israel later attacked Shifa hospital. Doctors Without Borders (MSF) “strongly condemn[ed]” the incursion, saying it “demonstrate[d] how civilians in Gaza have nowhere safe to go.” MSF director Marie-Noëlle Rodrigue stated, in an official statement, “When the Israeli army orders civilians to evacuate their houses and their neighborhoods, where is there for them to go? Gazans have no freedom of movement and cannot take refuge outside Gaza. They are effectively trapped.” Shifa was one of the over 10 medical facilities Israel bombed in its 50-day offensive. In 2000, Gilbert made headlines for saving the life of a skier who had been trapped in sub-zero water. She had been pronounced clinically dead, with a body temperature of 57 °F, but Gilbert managed to revive her. For his service, Gilbert was awarded the Northern Norwegian of the Year award. Before Operation Protective Edge commenced in early July 2014, Gilbert toured medical and health facilities and individual homes in Gaza, researching for a United Nations Relief and Works Agency for Palestine Refugees in the Near East (UNRWA) report on the dire state of the strip’s health sector. He wrote of “overstretched” health facilities, widespread physical and psychological trauma, “a deep financial crisis,” a lack of needed medical supplies, and a “severe energy crisis.” He also noted the “devastating results of the blockade imposed by the Government of Israel,” with rampant poverty, a 38.5% unemployment rate, food insecurity in at least 57% of households, and inadequate access to clean water. All of these already extreme ills were only exacerbated by the July-August Israeli assault on Gaza, an onslaught that left roughly 2,200 Palestinians dead, including over 1,500 civilians, more than 500 of whom were children. Israel has banned Human Right Watch investigators from entering Gaza since 2006; Amnesty International has been refused access since 2012. Dr. Mads Gilbert is the latest esteemed persona non grata to be added to this growing list. Other aid workers and medical professionals have faced even worse consequences for volunteering to help Palestinians. In August, Israeli occupation forces killed a social worker. In the same month, as the Israeli military engaged in a campaign to target and openly murder Palestinian civilians who spoke Hebrew, Israeli forces assassinated volunteers working with the Palestine Red Crescent, a non-profit humanitarian organization, part of the International Red Cross and Red Crescent Movement. A common myth suggests that Israel ended its occupation of Gaza with its 2005 disengagement. The state’s ability to ban, and even kill, internationally recognized human rights organizations and doctors—not to mention food, construction equipment, and medical supplies—from entering Palestinian territory, however, demonstrates that Gaza is by no means autonomous. Israel’s siege of the strip is clearly a continuation of its 47-year-long illegal military occupation. Despite removing 8,000 settlers and the military infrastructure that protected their illegal presence, Israel maintained effective control of the Gaza Strip and thus remains the occupying power as defined by Article 47 of the Hague Regulations. To date, Israel maintains control of the territory’s air space, territorial waters, electromagnetic sphere, population registry and the movement of all goods and people. … Palestinians have yet to experience a day of self-governance. Israel immediately imposed a siege upon the Gaza Strip when Hamas won parliamentary elections in January 2006 and tightened it severely when Hamas routed Fatah in June 2007. The siege has created a “humanitarian catastrophe” in the Gaza Strip. Inhabitants will not be able to access clean water, electricity or tend to even the most urgent medical needs. The World Health Organization explains that the Gaza Strip will be unlivable by 2020. Not only did Israel not end its occupation, it has created a situation in which Palestinians cannot survive in the long-term. In his July interview with Electronic Intifada, Gilbert made it clear that his work as a medical professional cannot be done—the Palestinian people cannot live healthy, yet alone free, lives—while Israel continues its illegal siege and occupation. “As a doctor, my prescription is very clear. Number one, stop the bombing, and that means stop Israel from bombing civilians and indiscriminately hitting families. Number two, lift the siege. And number three, find a political solution,” he stated. In a late October discussion with the Daily Targum, Gilbert encouraged Americans to do what they can to speak out against Israel’s illegal occupation and blockade of the Palestinian territories, and to pressure their government to stop its indefatigable support for Israeli crimes. At present, the US provides Israel with over $3.1 billion of military aid per year. In the past 52 years, over $100 billion US tax dollars have been given to the country in military aid alone. “You are the change-makers,” Gilbert told American readers. “The key to the change when it comes to the occupation of Palestine lies in the United States.” “Solidarity, not pity,” he said, is the solution.